This sermon, entitled “The Drum Major Instinct,” is all about the desire to win, to get to the top, to climb over others and exalt oneself. 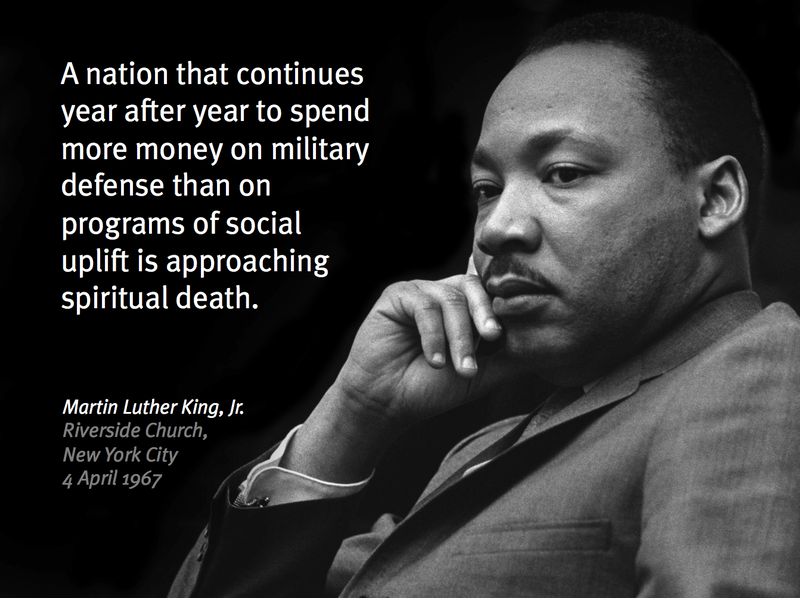 To illustrate the dangers of this, Dr. King talks about several things, including rampant consumerism that drives people to keep up appearances through buying stuff. I think Dr. King wouldn’t be too excited about his words being used 50 years later to sell trucks. Seems like his words are just relevant in the age of Trump and “America First” as they were during the age of Vietnam and Richard Nixon. Dr. King wasn’t selling anything. He was calling us to a higher good than self-enrichment. This commercial illustrated perfectly the danger of a neutered and tamed Dr. Martin Luther King Jr. His words shouldn’t reinforce our biases or provide comfort to our consumerist impulses; they should convict, as the words of any prophet should. Martin Luther King Jr worked for social justice and equality and the rights of all people to live and work and vote in a free society. And specifically, he worked to give black America the means to free itself from the shackles of white America. That fight is not over. If we are alive today, there is no doubt MLK would be in the streets of Ferguson and Baltimore and Oakland, standing in support of Black Lives Matter. There is no doubt he would be working against the continued austerity and attempts by elected officials to dismantle our safety net and measures he supported during his life like the Voting Rights Act and Medicaid. There is no doubt he would fight against income inequality and for universal health care. There is no doubt he would join the calls to remove the Confederate flag from government buildings, and for stricter gun control. There is no doubt he would be standing against hate and bigotry towards our Muslim brothers and sisters, and the call for more war overseas. He would not, in short, be a middle class white totem of good feelings and confirmation of our biases. He would still be the object of scorn and hate he was for most of white America when he was alive.